SK Telecom’s navigation system T Map will run on vehicles of Singapore’s biggest car-sharing service provider Grab within the first quarter of the year, the South Korean mobile carrier said Wednesday. 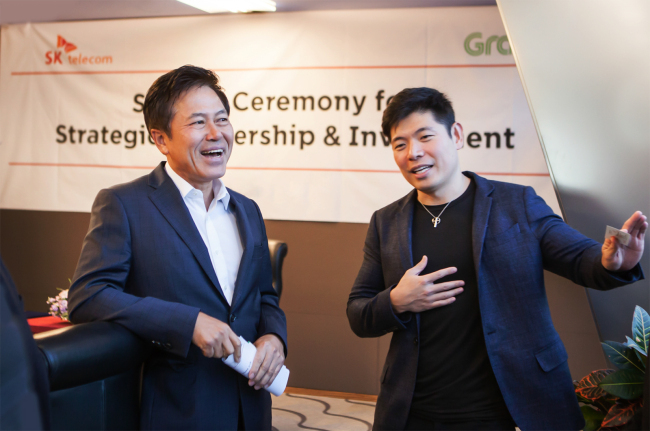 SKT and Grab have signed an agreement to set up the joint venture Grab Geo Holdings in Singapore, co-led by Grab’s service head Jerald Singh as chief executive officer and SKT’s navigation development chief Kim Jae-soon as chief technology officer. SKT CEO Park Jung-ho met with Grab co-founder and CEO Anthony Tan at the mobile carrier’s headquarters in central Seoul to seal the deal. The joint venture will launch a navigation service for Grab drivers in Singapore in the next two months, which will be based on the T Map system that taps into the Korean telecom firm’s key navigation technologies, including big data analysis algorithm and ultra-precise GPS. T Map is the most widely used navigation app in Korea with around 11.5 million active users per month. It will eventually be expanded to Malaysia, Indonesia, Vietnam and other parts of Southeast Asia. Established in 2012, Grab is the largest car-sharing service provider in Southeast Asia and the third-biggest in the world after DiDi and Uber. It operates in 336 cities across eight countries, including Thailand and Philippines, with a total of 135 million app downloads. “The creation of the joint venture will be a starting point for us to make great impact in changing the way mobility services are used in Southeast Asia,” said SKT CEO Park.